As the electronic word slowly usurps the printed word, books are becoming increasingly fetishized. 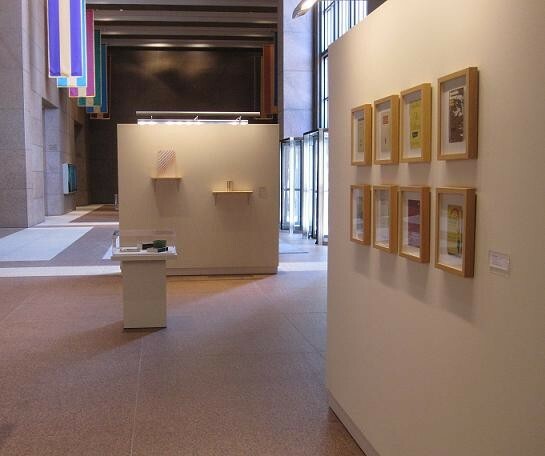 “Book Report,” organized by Kinzelman Art Consulting in the lobby of the Bank of America building, brings together a host of book-related works. Given all the recent bank bailouts (and my personal animosity towards BoA and the jacked-up interest rate on my credit card), I found it particularly fitting that the show includes Conrad Bakker’s carved and painted replica of a Penguin Classics edition of Karl Marx’s Capital: Volume One, displayed in a vitrine. 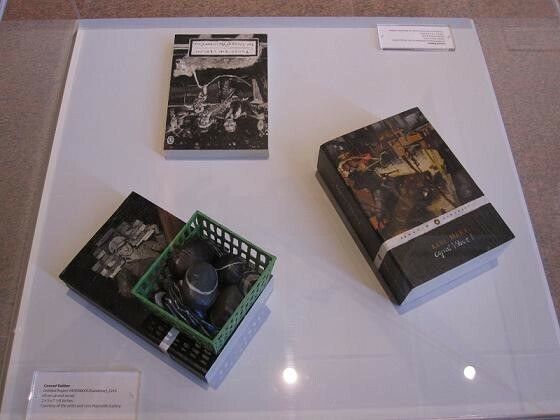 Other works are hung on temporary walls, including images from art duo Manual’s ongoing series of book photographs. Their great homages to Josef Albers’s square paintings, featuring books of different sizes and colors stacked on each, are on view. Daniela Comani offers images from her series “New Publications,” in which the gender-specific titles of classic literature are tweaked – as are the viewer’s assumptions. The digitally manipulated photos of slightly used paperpack covers are spot-on, and it takes more than a moment to notice Dostoyevsky’s Sisters Karamazov or Ralph Ellison’s Invisible Woman. Meanwhile, Darryl Lauster’s cast-resin books turn reading material into dark, weighty slabs that come across like small-scale monoliths. It’s an incredibly nice show and would be for any venue, let alone a bank lobby. If you work downtown, you should definitely check it out, and if you don’t, it’s worth the trip.